Its Almost Halloween and that means its a great time to watch scary films. This week I review straight to DvD new comer Dark Country. 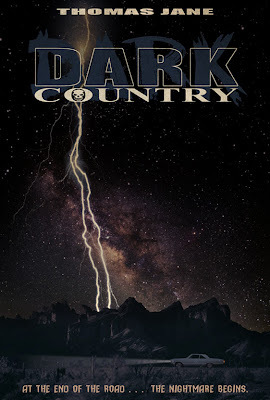 Dark Country is a horror film marking the 2nd directorial debut of Thomas Jane (Punisher Fame). The Director smartly decided to cast Thomas Jane in the lead role with back-up role going to the veteran thespian Ron Perlman as the Sheriff. The acting is actually pretty good all things considered BUT the story is the retard baby of Alfred Hitchcock and Rod Serling. If you enjoy the thrill of a deeply complex psychological thriller, you will be sadly disappointed. The B-Listers bring their A-Game but hired D-List writer Tab Murphy, whose writing credits include "I was a teenaged draculur" and a few pathetic adaptations. Overall I give this movie one Smiley Face and one Angry Face.